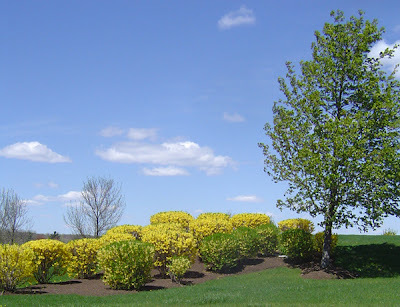 These Forsythia were planted in the center of the parking lot of Latham Farms which is a big box store complex. Forsythia are a beautiful yellow during this time of year, but once they lose their flowers, they become a rather stalky non-descript shrub. Hi YOY, just checking in ..wish you and your mom good luck with the new meds..and all that stuff..good thing you did a kitchen check..wow cottage cheese in the cabinet ..not pretty.